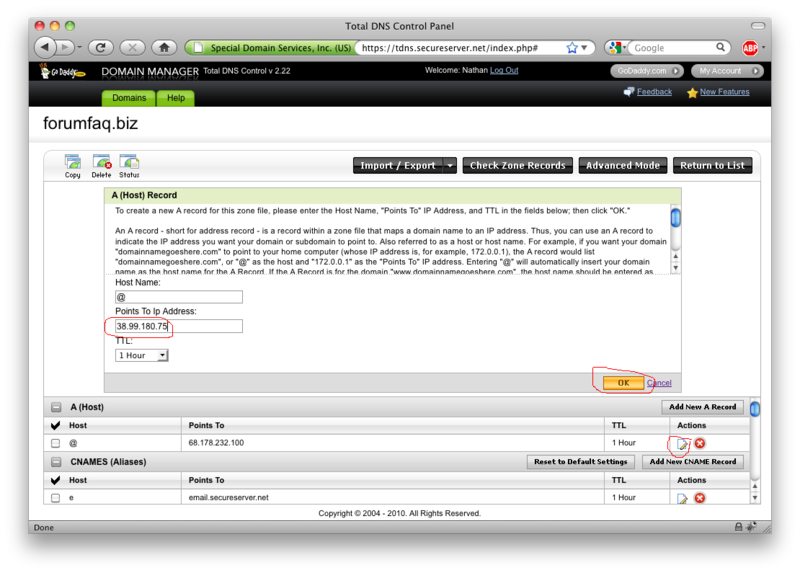 Forwarding your GoDaddy domain to your Taiga Forum is pretty simple. First, you need to tell me what the domain is that you want to forward so I can set up your forum to receive it. I'm always available via private message here or email. It may take a few hours for the forwarding to take effect. Don't forget to let me know (either here or via private message or else via email) what your domain(s) are - I have to set things up on this end in order for it to work. If you have any questions, don't hesitate to ask. I'm available via private message here or email. Forwarding your GoDaddy domain to your Taiga Forum is pretty simple. First, you need to tell me what the domain is that you want to forward so I can set up your forum to receive it. I'm always available via private message here or [email=njahnke@gmail.com]email[/email]. Once that's done, you just need to follow the steps below: 1. Go to [url=http://www.godaddy.com/]godaddy.com[/url] 2. Click on My Account (at the upper right) 3. Click "Please log in" if you are not already logged in 4. Enter your GoDaddy username and password if you are not already logged in 5. 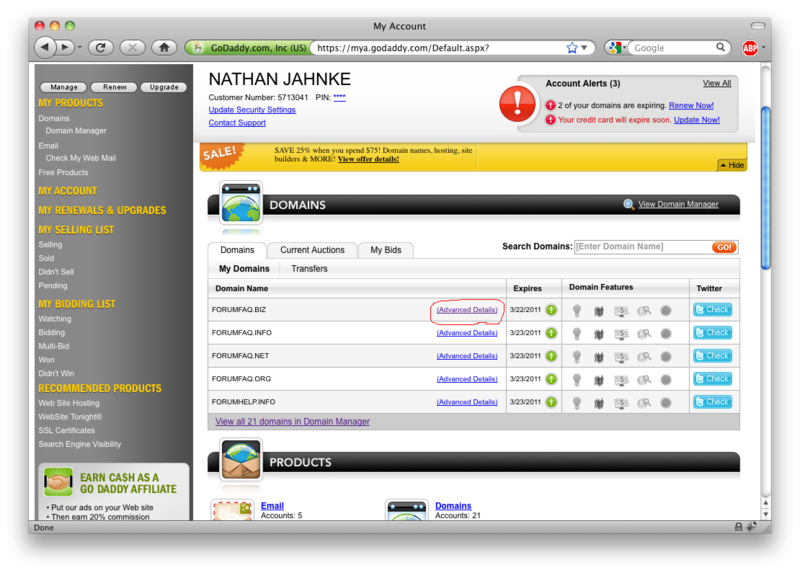 Click on Advanced Details next to the domain you want to forward, as shown below [img]http://www.taigaforum.com/taigatips/godaddy_domain_forward_1.png[/img] 6. 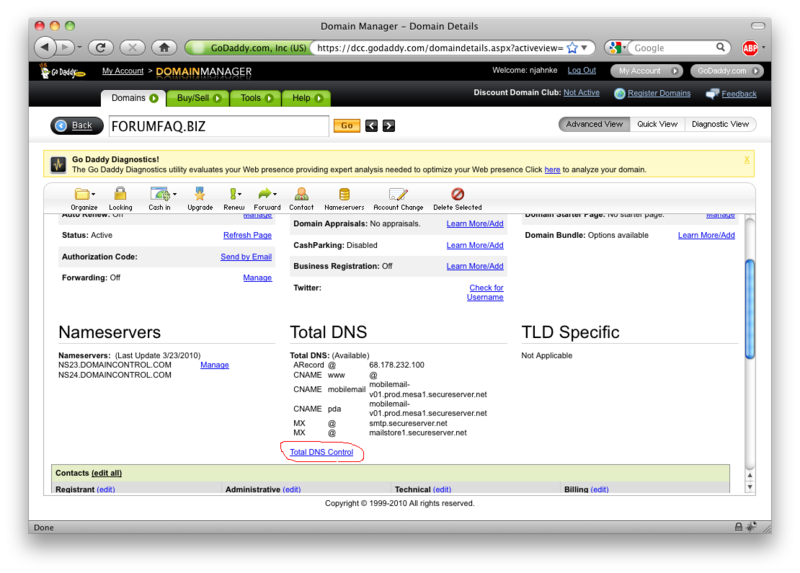 Click on Total DNS Control about halfway down the page in the middle of the screen, as shown below [img]http://www.taigaforum.com/taigatips/godaddy_domain_forward_2.png[/img] 7. Click on the little "edit" icon ([img]http://www.taigaforum.com/taigatips/icon_grid_edit.gif[/img]) under the "Add New A Record" button, as shown below 8. Delete the existing IP address under "Points To Ip Address" and enter this: [b]38.99.180.75[/b] [img]http://www.taigaforum.com/taigatips/godaddy_domain_forward_3.png[/img] 9. Click OK It may take a few hours for the forwarding to take effect. Don't forget to let me know (either here or via private message or else via email) what your domain(s) are - I have to set things up on this end in order for it to work. If you have any questions, don't hesitate to ask. I'm available via private message here or [email=njahnke@gmail.com]email[/email].